I've updated to firmware v0.24 and can't seem to be able to transfer save files back. Now it seems save files use .sav instead or srm so I copy and paste the name including the extension to my existing saves but when I transfer them I get this message saying the file size is too big. The .sav I'm trying to move is 8kb. Here's the message I get. Has something changed in recent versions? I have the save/write setting to 0, but I tried with 1 as well to no avail. I noticed going through my backups that some games have 8kb, and some 32kb saves from the previous versions (used to be srms). This particular game Final Fantasy Adventure is 8kb and called Seiken Densetsu for the rom and save file. I'll look into it. There appears to be some type of I/O bug in v0.24 that is affecting some cart types. What is odd is that the bug is affecting cart types that had no code changes made. What firmware version did you previously use with the GB carts? I looked at the code and the .SAV extension has been used for GB carts since at least v0.18 (prior to when I started making firmware changes). If you could revert to a firmware that works and identify the version, then that would help. I'd hate to waste time looking for a bug in my code changes (v0.22, v0.23, v0.23a, v0.24) if the bug actually exists in the base firmware that I inherited. Thanks for the reply. Actually I reverted to .20 to try, which was the one I had previously, and it's also not working. So for now I'm back in .24. Truth is I hadn't done game boy save transfers since .17 or .18 I think. Back then the save format was .srm. I'm going to try other games than Final Fantasy Adventure just to make sure it's not just this one game. Ok I tried with Wario Land: Mario Land 3 and it works fine. So the problem might just be Seiken Densetsu aka Final Fantasy Adventure. My cart is the US ntsc version. and the save was from the same version. When I start a new game, save and transfer that save it gives me a 1kb file (or in properties it even says 512 bytes). Which is weird. The previous was 8kb and so it can't be transfered back. Not too sure what happened, but I don't want to waste your time for a single game. Thanks Skaman, everything you do has been so awesome for the retrode. Edit: Nori posted reply #3 while I was still typing the text below. So the problem seems to be the file size and not what I had guessed. The problem might be this: For the transfer to work, the save file that exists on the Retrode must be overwritten "in place": Open file X, overwrite data, close file X. Your PC might instead be trying to create a new file Y, fill it with the data, close file Y, delete file X and finally rename file Y to X. The latter does not work with the Retrode. It fails in the first step (create new file Y) because there is no free space. The Retrode has not enough memory to buffer a temporary file, and it cannot tell where else the data should go (config? save? ...). First, check that the save file on the Retrode is exactly the same size as the save file that you want to copy over. 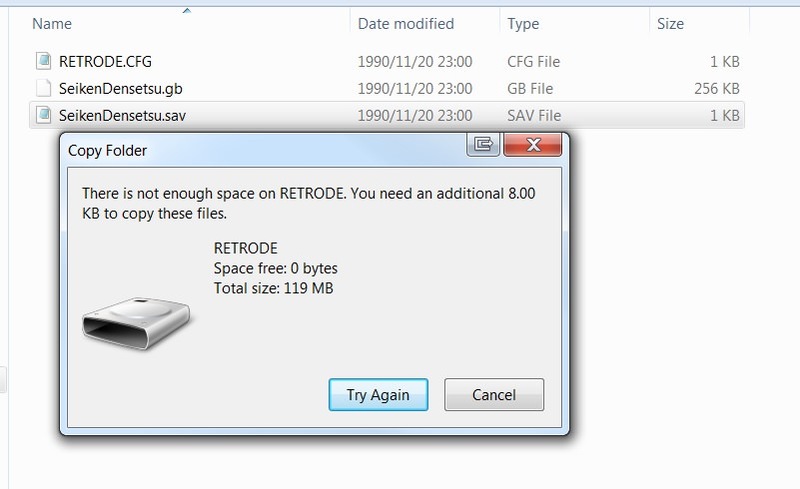 If the sizes match, "delete" the save file on the Retrode. This will only remove the file's directory entry and mark the area where the file is mapped into the Retrode's virtual volume as free. The actual save on the cartridge will not be harmed. Finally, copy your new save file to the Retrode. This should cause the PC to write the data to the proper area. Warning: In the time between deleting the Retrode save file and copying the new one, do not edit anything else on the Retrode. Thank you Wannado. I tried that and unfortunately it doesn't work. When I delete the save file it says the Retrode has 512b of free space. The save I had from before was 8kb, and so I still get the message from the image in the initial post. If I save a game and copy that 512b file out of the retrode, delete it from the retrode, and move back that recent one will transfer back and the newly created save will still be there. In the past all Game Boy games I had transferred saves out from the cartridge to the computer have worked, and a few that started on the computer (via emulator) to the original cart worked as well. From all appearances all this still happens and functions properly except this one title. Thinking back I can't even be sure that this game's save had ever been back and forth with the Retrode. It might have been only through an emulator. Still it's odd since other games using the same emulator did work being sent back, and I checked the rom version I have for this game and it seems to match "Final Fantasy Adventure (U)" which should be the us version of the game, which is the same as the cartridge itself. Hi Nori, I just noticed that I have the FFA game, too, only with its European title "Mystic Quest". The game's mapper chip has exactly 512 half-bytes of RAM built-in. They appear as 512 bytes, with only the lower half of each byte having actual storage on the chip. The Retrode detects that correctly. I'm using the KiGB emulator, version 2.05, which too creates an 8 kiB save file for that game. The game still only uses the first 512 bytes of it, so the rest of the file is garbage (it's quite obvious in the file that I had once saved). Long story short, to copy your emulator save game of FFA to the cartridge, try using a hex editor to copy only the first 512 bytes from the emulator save file to the Retrode save file. Note: IIRC, the Retrode shows the unused upper half of each byte as hex F while KiGB seems to prefer 0. This should have no effect when copying from the emulator file to the Retrode file. I don't remember if it's a problem when copying in the other direction, from the Retrode to the emulator file. Ok. So MBC2 saves are the issue. Thanks a bunch Wannado. I'm going to try that out! Tried it out and it worked! Problem solved.